Christ be upon you this Holy Week. As they shared the story of the empty tomb. But because the resurrection they preached is still happening now! Hello! Today I’m making this year’s Good Friday litany publicly available. Most litanies appear in my Patreon for subscribers, but I try to make one or two per month available here. Please consider joining my Patreon, especially if you or your community are using my work regularly - by doing that you help make this work sustainable for me and my family. $1 - $3 is all it takes for your community to get access to my weekly offerings. Hopefully you’ve been immersed in the journey of Lenten self-reflection. In Lent we clear space for exploring our inner selves, light and shadow, our complicities in systemic injustice, our addictions and unhelpful behaviors. This is all leading up to Good Friday, when Christ himself enters the shadow; when together we observe holy silence in following him on that journey. e observe a holy silence. I’ve moved much of my work over to Patreon. So thanks for reading and subscribing. This week is Palm Sunday, and the Lectionary offers two options. I'm using Liturgy of the Palms references for this prayer. Enjoy, and if you have a second, please let me know how this Lent series has gone for you and your community. Thanks! This week's litany follows along with the Lectionary texts for week 5 of Lent. A strong theme of wilderness, persistence, and joyful homecoming threads through these texts. I hope you're all leaning in to the Lenten journey in some way this year - letting the wilderness Christ leads you into shape your soul and your practice, offering you a new way of being. In Lent, we follow Christ out to wilderness places. We deny ourselves the comforts that numb us. We rid ourselves of the distractions that consume us. Thanks for following along. If you haven’t grabbed a copy of my book, may I suggest that it makes a great Easter gift :) Also, I’m on instagram @thelitanist ! come join in the contemplative fun going on there! Much love to all you readers and pray-ers out there embodying Divine Love and Light. Before I get into the litany for this week, I want to say thank you thank you thank you for being on this journey with me. March has been the biggest month ever for me in terms of new patrons, and I am so stinking grateful. Welcome to new friends in this space! May it be a blessing to you! May it throw you a life-raft on a sinking day! May it jolt you with encouragement in a distressing moment! May it offer you sustenance when you're empty! Amen, Amen. Also, thanks for your patience while I was on vacation last week. After a rough month, I needed the break to stoke my curiosity and creativity, and hallelujah the LORD provides. Ok, this week's Lectionary is juicy! The prodigal son. Psalm 32. The beautiful "new creation" language in 2 Corinthians 5. Week 1 we explored Weakness, week 2 Loneliness, week 3 Longing, and now Wandering. (preview: next week we're pondering "Wilderness.) So basically the hard parts of the life of faith. Which is what Lent is for - uncovering our blindness, exposing our need and vulnerability, urging us toward repentance. It's not supposed to be fun, but it is necessary for our growth. May you find more joy, peace, and love during your Lenten journey. In this week's Lectionary, I'm struck by the sense of loneliness in the passages. I keep thinking how exhausting and draining it must have been for Christ to always be on the run, moving from place to place, never pausing at home, always faced with someone wanting to kill him. And I'm struck that Lent is a time for us to face our own loneliness with intention. If ever there were a time to seek out solitude for self-reflection, Lent is it. It's true, we are spiritual beings having an embodied human experience here on earth (at least that's my belief), and there is something inherently lonely about that. But also, the community of humanity is bright and diverse and available - and I think part of why we're here is to make connections and realize our connectedness on both a human level and a spiritual level. Those two ideas exist in tension. And I imagine they created tension for Christ as well. It seems like we have a few ways to combat loneliness: by realizing our oneness with God, deep in our innermost selves, often via solitude; by realizing our spiritual citizenship in heaven, that we are part of something more vast than what we can see; and by realizing community with other spiritual humans on earth. We have these means, but I think we are still going to feel lonely sometimes - it's just part of the human experience. One that has a lot to teach us if we are willing to listen. Sent to earth to learn lessons and build outposts. That tests our resolve and our stamina. I got waylaid by a terrible flu for the last 7 days. And still my brain is not entirely online. I find it so interesting how the Lectionary seems to coincide with my own real-life events. Here I have been in a fog of weakness, reliant on help from others just to get through. And the Lectionary brings me this story. In Luke’s account of the temptation of Christ, we see Christ refute the devil’s efforts at getting him to “prove” himself. If you make bread from stones, you’ll show us all. If you worship me I’ll make them know your authority. If you jump off the temple room, the angels will be forced to carry you, and everyone will know you’re the real deal. Isn’t this what we are always feeling like we have to do as humans? Prove ourselves? We feel like we have to prove that we’re strong, or invincible, or in control, or knowledgeable, or, at the very least NOT WEAK. I can tell you I have had not one shred of control over anything in the last week. Every plan canceled. Every intention thwarted. Every task put off. And Jesus refuses the whole game. He goes willingly to the physical weakness of hunger and deprivation. He goes willingly to the vulnerability of harsh desert. He doesn’t retreat to a well-stocked fortress, but an empty wasteland of weakness. I guess this is a lesson we learn from Lent: that weakness is strength. That proving ourselves is a game the ego plays, not the Christ-consciousness. PS: There are 3 days left to get a special by-request litany from me! A number of things are informing this week’s litany. One is the newest climate change news. Another is the UMC General Conference, which I’ve been following intently. And of course there’s the rest of the news in general. So as I read these Lectionary passage for the week, gosh I feel impatient! Ready for justice to be served. Ready for righteousness to prevail. Ready for the earth to be set right. I hear Jesus’ words “You faithless and perverse generation! How long must I be with you and bear with you? !” and I resonate with them. I resonate with that feeling of mixed longing and exasperation that I hear in those words. This week is Transfiguration Sunday. We pay attention to the similarities between the story of Moses coming down glowing from Mount Sinai (Exodus 34) and of Christ’s transfiguration on the mountain, when he glows with light, and the voice of God from heaven affirms him (Luke 9). The text says that the disciples were “weighed down with sleep,” but somehow they manage to stay awake and glimpse the glory of Christ’s glowing light. And we pray for the courage, patience, and fortitude to stay awake long enough, and for our consciousness to be expanded enough, to see it in our time. Struggling for a glimpse of your glory (1). For heaven to come on earth. .. Thanks so much to all who’ve jumped into the fun on Patreon! Know that you’re contributing to keeping the lights on here at franpratt.com. If you prefer to support my work in another way, you can grab a copy of my book and give it a positive review. I’m sending you love, gratitude, hope, and peace, regardless. PS: There are 9 days left to get a special by-request litany from me! This week’s Lectionary covers 1 Corinthians 15, and a continuation of Luke 6, the Sermon on the Plain. Like the Beatitudes in Matthew 5, Luke’s account contains some of Jesus’ most radical and counter-cultural teachings… themes religion has historically not applied or taught well. Instead of embracing non-judgement and non-duality, the church became famous for condemnation. Instead of loving enemies, the church aligned itself with warring powers. These are hard teachings, especially for Western ears to hear. Especially for wealthy, privileged Americans to hear. We need these universal spiritual teachings in front of our eyes and in our ears, penetrating our consciousness anew in these times. Asking us to practice counter-cultural ways of being. We’ve been having such creative fun with our latest sermon series at Peace, “Poetic Imagination,” exploring the richness of poetic imagery both in scripture and in human expression. If you’re thinking “this is fluff, not theology,” you would be wrong! Beauty and creative expression are core to God’s character, to our spirituality, and to our experience of the both the Divine and the ordinary. Our creativity is part of our Imago Dei. Poets teach us how to observe, and blur the lines between the sacred and the profane. They give language to the human condition and expression to our depths. I’ve been writing poems and song lyrics all my life, and naturally I had to write a litany around this theme. If only we are paying attention. Point us ever in your direction. Spirit in her radiant beauty. Bringing the standard of heaven to all the earth. For more litanies, check out my Patreon, and my new book, available in paperback and kindle ebook. This week’s Gospel reading includes Luke’s account of the Beatitudes. This account is also known as “blessings and woes,” as it differs from Matthew’s Beatitudes significantly. However, the spirit is the same, and they are incidentally not dissimilar to Mary’s Magnificat from a few chapters earlier in Luke. “Woe to you who are rich,” echoes Christ’s Mother’s words from years earlier: “he has filled the hungry with good things, and sent the rich away empty” (1). I’ve been exploring themes of privilege and connectedness in this Epiphany series, and this week’s “blessings and woes” fit right in. Woe to you who are privileged, for your privilege blinds you. Blessed are you who who understand that we are all connected - by suffering, by need, by humanity… and that we are the very ones we judge to be lowly. If we let them, this teaching of Jesus has the capacity to awaken us from our deadness, our un-compassion, our judgement, and into acceptance, forgiveness, and love. May it be so, and may we pray with humility and willingness to be transformed. God, we’ve been stuck in cycles of scarcity. You bring us into abundance. We’ve worked our fingers to the bone in our own power. You invite us into the ease and flow of yours…. The gospel reading this week comes from Luke 4. Jesus has just quoted Isaiah 61 in the synagogue on a Sabbath, stating that his mission is the same; that God “has sent me to bring good news to the oppressed, to bind up the brokenhearted, to proclaim liberty to the captives, and release to the prisoners…” and so on. “Today, this has been fulfilled,” he says (Luke 4:21). His mission is freedom and deliverance and grace. And then in the section we’re given this week, Jesus goes on to speak a bit more about his mission. He gets more specific. As Karoline Lewis puts it, Jesus “...reveals for whom [he] has come -- the widows, the lepers, the outsiders. Jesus’ whole ministry will be for the least of these, over and over again. Moreover, Jesus is for everyone” (2). And with that revelation, he is promptly driven out of town, his life threatened, and he must escape by (presumably) miraculous means. Why were those folks so enraged by Christ’s words there? Back to Dr. Lewis: “Jesus’ sermon in Nazareth is a prophetic message. Jesus tells the truth about the realities of our world, where the lowly are looked down upon, where the poor sleep in cardboard boxes under freeways, where the captives remain in their prisons, where the rich live exceedingly full lives.” Jesus confronts their, and our, privilege. The outcast, the forgotten, the marginalized, those who exist in the liminal spaces - those are always the ones at the center of Christ’s gospel. And we do well to hear, and to allow the spirit to work her grace on us as we confront our own privilege as hearers, to allow ourselves to give up the prized place of centrality in the narratives we tell ourselves. It may make us mad at first. It may make us want to run Jesus, or whomever the prophet confronting us happens to be, out of town or off a cliff (3). But if we’re following Jesus authentically, we will have to confront our own privilege, grow some compassion, and get outside of ourselves. Here is a prayer for that process. I find it interesting that the Lectionary always seems to speak so keenly to the current moment. The past few days I’ve contemplated the state of things, and Dr. King’s legacy, and how the Church (capital C) is doing, and how the country is doing. And I attended an MLK memorial/celebration march and service at a local sibling church, which was inspiring in some ways, but sobering in others. We have so far to go with dismantling white supremacy in this country, and within the American Church; and that is not a new or disputable fact. We are all part of each other. Any separation is only imagined. *Even small amounts matter. But I know, not everyone can contribute financially. Do what you can, educate yourself via the multitude of free resources in local libraries and the internet, be curious, be humble. And may God bless your efforts. This week’s Lectionary readings include the account of Christ performing his first recorded miracle: turning water into wine at a wedding. Also known as the time Jesus BROUGHT THE PARTY. There are so many interesting and fun details about the story: the way his mom talks him into it. The way the people react. The way he tries to keep it on the DL. His reluctance (I imagine a twinkle in his eye). The way he nonchalantly instructs them to “draw some out,” no big deal. And the most endearing part, to me, is what it says about celebration. That celebration is worth doing. That Jesus is able to look at this world, see it for what it is, accept it, forgive it, and still think it’s worth partying. You’ll get access to Weekly Lectionary litanies, plus other content I post on a weekly basis, and various other liturgy-related goodies. Many thanks to all the new folks who have come on board in the past couple weeks. The party has only just begun! where you’ll find my weekly and monthly litany series, and more. At the turn of the year, many of us set aside time to reflect and set intentions for the coming year. How do we want to be? What do we want to carry forward? What do we need to let go of? What changes do we want to see made in the world that we might be part of. I personally have a going list of hopes, dreams, and intentions. There are things I want to accomplish, changes I want to make, goals I want to meet, and ways I know I need to grow and evolve. My intentions range from the physical (improve fitness level, etc), to career (make my writing practice sustainable! ), to spiritual, emotional, and relational; to collective and societal. So, if you are on that journey of looking forward and speaking and imagining new things into being, I invite you to pray this prayer asking for patience to play the long game. There’s so much to be done. So much change to be made. And provide for us in our process. And the world more truly peaceful (1). 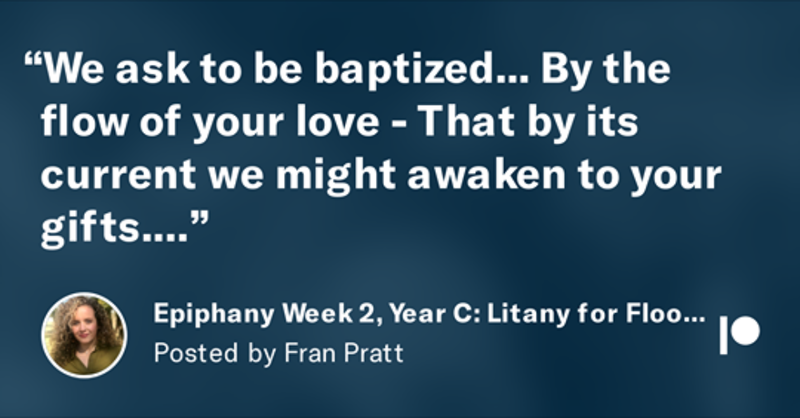 This week’s Epiphany litany is up on Patreon! If you haven’t checked in in a while, you may be feeling curious about why I’ve made a shift this year to making most new litanies exclusive to Patreon subscribers. This post should help satisfy your curiosity. The short answer is: SUSTAINABILITY. The long answer is: GROWTH. I’ll have more to say about these in the coming weeks, but for now I hope you can feel the love I’m sending you, and have always sent out into the world in each and every post on this website. The whole point of this work is and has ever been to FLOOD THE WORLD WITH LOVE. It’s the long game and the short game. The means and the ends. You can also drop me a line via the contact link on the SUBSCRIBE page above if you have more questions. Got an idea? Send it my way. Got feedback? I’m all ears. *The ebook does not smell like real paper. What we’d like to experience and enjoy. As Christ has taught us. Of the peace, joy, and love of God. From a reading of Luke 2, the Lectionary gospel for Christmas, Year C.
Before you come in our door. The most monumental works are done in the smallest increments. The most glorious hymns are sung by the croakiest voices. The most brilliant cathedrals are built by the roughest hands. The most fervent prayers are prayed by the gentlest souls. The Christ was telling the glory of God. The highest heights are made low for you. You level the roughest terrain (1).